Are you looking for job tips in a tough economy? Chris Tidball, professional consultant and author of Kicked to the Curb, shares his insights and expertise with LoveToKnow Jobs readers in this exclusive interview. LoveToKnow (LTK): What do you see as the biggest challenges faced by 21st century job seekers? Chris Tidball (CT): The dynamics of the employer/employee relationship will be changing with less dependence on a traditional workforce. Over the years it has become progressively more expensive to hire and retain full time employees. Increasing costs associated with workers' compensation, unemployment insurance, disability, employer social security contributions, and frivolous litigation have all played a role. In the "new economy" another dynamic of increased government mandates and regulation will likely result in employers scaling back on the traditional relationship with increasing reliance on business relationships, outsourcing and independent. LTK: Does looking for a job in a tough economy require a change in mindset? CT: Job seekers need to understand that the business dynamic has changed. For all of the above mentioned reasons, employers are leery of adding to staff. Employers will continue to look for people who can provide them with solutions, in particular outside vendors. By being the solution, it is possible to not only increase income but independence. Consider the business owner who decides to outsource a department such as accounts receivable. For people with this background, providing the outsourcing solution would be the key to both financial and personal independence. LTK: What can job seekers do to cope with negative publicity about economic problems? CT: It's tough to turn on the news every day and hear of another round of layoffs or another company moving jobs to India. Unfortunately, it has become a permanent fixture in the new economy and isn't likely to disappear. It is very important to get news from all sources, and recognize how we can each play a role in creating an environment that fosters economic growth and opportunity. LTK: How can job seekers really help themselves stand out to prospective employers? CT: Think outside of the box. For every open job there are exponentially more candidates than even two years ago. Waiting your turn in line isn't likely to land a person their dream job. Rather, job seekers should place themselves into dynamic situations where they will encounter potential employers. Leveraging relationships on such websites as Linked In or Plaxo is a great way to start. Attending Rotary Club, Chamber of Commerce meetings or trade shows is an ideal way to come face to face with decision makers who will help high potential candidates move to the front of the line. LTK: How important is professional networking to job seeker success? CT: Networking is the single most important thing that any job seeker can do. Remember, if you are out of work, looking for a job is your new full time job. Your rolodex, collection of business cards, social and professional networking sites are the place to start. Advertise that you are looking for new opportunities. Being out of work, or even underemployed, doesn't carry the stigma of years ago as it has unfortunately become the norm. People are inherently good and will bend over backwards to help others, especially family, friends and business acquaintances. Use that bond to your benefit. LTK: Do you have any "off the beaten path" suggestions for job seekers to find employment opportunities? CT: Think outside of the box with the knowledge that most jobs are not advertised. My last two jobs were actually created for me after I presented a compelling business case to small business owners. Recognize what your talents are and then consider who you can help. Despite my background in the financial industry, neither of the above referenced jobs was in that industry. Rather, I recognized a need and devised a solution that was pitched as if it were my own business, which in a sense it was. LTK: What do you see as the most common mistakes that job seekers make? Very few jobs are listed in the classifieds, yet people routinely use this as their main source when looking for opportunities. Expand your horizons to not only online job postings such as Monster or Hot Jobs, but networking sites where you can reconnect. Following the traditional norms of filling out the application, enduring cattle calls and spending hours with personnel answering questions that have nothing to do with your ability. By seeking out decision makers with viable solutions to real world problems you can effectively cut to the front of the line. Not having a resume that can get by the initial HR screening process. Most people don't realize this, but resumes are often scanned and searched for key words. By understanding how to effectively leverage keywords, candidates can often improve their chances of getting hired. LTK: What do you feel is the key to career success regardless of economic conditions? CT: Networking is the key to success in anything you do. It is critical that people use every opportunity to maximize their exposure through personal, business and online social networking. Remember the old adage, "it's not what you know but rather who you know." LTK: What is the main message of Kicked to the Curb? CT: No matter how bad things seem now, they will get better. 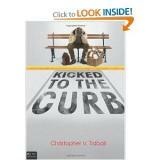 For many, being kicked to the curb will turn out to be the best thing that ever happened to them. By embracing the new paradigm espoused in the book, understanding the future business dynamics and adapting to these changes success is sure to come. LTK: How can job seekers benefit from reading Kicked to the Curb? CT: I had a boss once who said that losing a job was not a matter of if, but when. Having lived the experience of seeing my twenty year career come crashing down amidst a financial meltdown that nearly caused the failure of a company deemed too big to fail, allows me to share a firsthand account of steps that should be taken. While the book won't create a new job, it will give the reader the benefit of understanding 20 simple steps to take to make sure that they position themselves properly to land a new job. LoveToKnow woul like to thank Chris Tidball for taking time from his busy schedule to share the benefit of his expertise with readers. To learn more about his book or consulting work that involves providing individuals and businesses with innovative solutions to developing new revenue streams, visit ChrisTidball.com. Find additional job tips in a tough economy in Tidball's artilce, Reinventing Yourself in the New Economy.